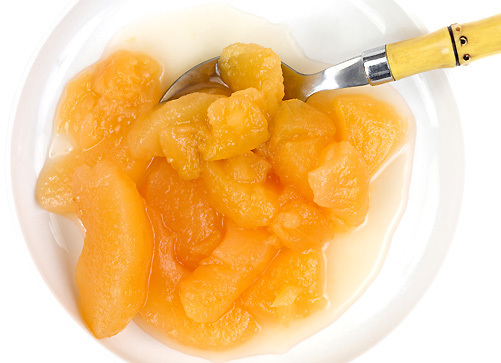 Quality: Select ripe, but firm fresh peaches. Red Haven, Redskin, Sun High, and other varieties of similar quality are suitable. 2. Peel peaches. To loosen skins, submerge peaches in boiling water for approximately 30-60 seconds, and then place in cold water for 20 seconds. Slip off skins and prepare slices 1/2-inch thick. 3. Place slices in water containing 1/2 tsp. of ascorbic acid crystals or six 500-milligram vitamin C tablets in 1 gallon of water to prevent browning. 4. Place 6 cups at a time in 1 gallon boiling water. Boil each batch 1 minute after the water returns to a boil. Drain but keep heated fruit in a covered bowl or pot. 5. Combine water, sugar, Clear Jel®, and, if desired, cinnamon and/or almond extract in a large kettle. 6. Stir and cook over medium high heat until mixture thickens and begins to bubble. 7. Add lemon juice and boil sauce 1 minute more, stirring constantly. 8. Fold in drained peach slices and continue to heat mixture for 3 minutes. Fill jars without delay, leaving 1 inch head-space. 9. Remove air bubbles and adjust headspace if needed. Wipe rims of jars with a dampened clean paper towel; apply two-piece metal canning lids.